The internet has had a major effect on… well, everything! I mean your reading this online right now! Whether it’s your work, looking at picture of cute cats, or just doing some online shopping. Having access to an internet connection gives you an endless amount of options and resources to explore. Take fireworks, for example: a product that is rather specialized in nature and not something every shop will sell; especially the products featured in some of the more extravagant displays. Nowadays, it’s much easier to find and purchase fireworks. In one way this is a great thing, because you have a lot more choice and can find some fireworks for dirt-cheap prices, while being in the comfort of your home. A lot of the time, though, what you’re being encouraged to buy won’t be regulated or safe. So, here’s a few tips to make sure when buying fireworks online that they’re safe for use, highlighting the type of vendors and products you ought to avoid. It’s unlikely that you would wander into a dodgy-looking shop on your local high street and buy what would most likely be poor quality fireworks. So why do the same thing via an online store? A legitimate fireworks retailer will stock high-quality products that comply with British standards. Fireworks are perfectly safe when used correctly. A retailer with experience and knowledge of fireworks will be able to provide the necessary safety tips. You also have to consider the quality of the fireworks; shoddy goods that don’t comply with the right standards will be extremely dangerous. Here at Fantastic Fireworks, we take pride in the products we sell, viewing safety as a key priority. With over thirty years of experience in the fireworks industry, we’ve established ourselves as a trusted brand. That sell safe fireworks at the highest quality. We were also the winners of the 2015 Fireworks Championship, so we’re not too shabby at putting on a firework display either! While there isn’t a particular qualification or type of training needed to allow you to use category 1, 2 and 3 fireworks. It’s worth taking the time to assess the situation before you buy anything. The main thing to consider is the size of the area in which you’ll be setting off the fireworks. The British Standard for Fireworks (BS 7114) states that fireworks are separated into four categories. Indoor fireworks = Category 1: These type of fireworks will be used for displays in extremely restricted spaces, which in most cases is an indoor environment. Garden fireworks = Category 2: Probably the most commonly purchased type of firework, especially towards the end of the year with lots of bonfire night, Christmas and New Year celebrations. Display fireworks = Category 3: These will be the fireworks you’ll see at larger scale public displays, designed for use in more open areas such as a playing field. Professional fireworks = Category 4: Not your everyday type of firework. Used for much grander commercial displays and events and will require professional training to be used. You’ll most likely be looking to buy either Category 2 or Category 3 fireworks. All depending on the size of the area and how much bang you want for your buck. It’s vital to work out which category of fireworks is suitable for the area in which you’ll be lighting them. For example, you don’t want to set off a firework in your garden that’s designed for a larger display area. Not only would the noise be an absolute nightmare for your neighbours. It could be a hazard if you have any overhanging trees or nearby objects. 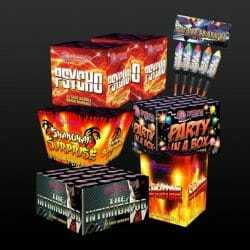 If you’re unsure about the type of fireworks that best suit your needs, don’t hesitate to get in contact. It’s always better to be safe than sorry. Whether it’s just a small gathering for your display or a large event that needs something special for the finale. It’s essential to buy the correct fireworks and learn how to use them safely. With bonfire night around the corner and Christmas & New Year on the horizon, now is the perfect time to buy fireworks and plan some celebrations. If you’re interested in checking out our wide range of high-quality products or want more information about planning your firework display, don’t hesitate to get in contact via this contact page or call 0800 511 511.